Famous For: Architecture, History, Excursion trip, Photography and sightseeing. Entrance Fee: The entrance fee for each Indian adult is 5 INR. For foreigners (adult), the entrance fee of Tughlaqabad Fort is 100 INR. Entry is free for children up to 15 years of age. There is no fee for taking photographs. Visiting Time: It remains open to visitors on all weekdays and weekends, between 7am to 5pm. Visit Duration: It will take approximately 2 hours for complete exploration of its premises. 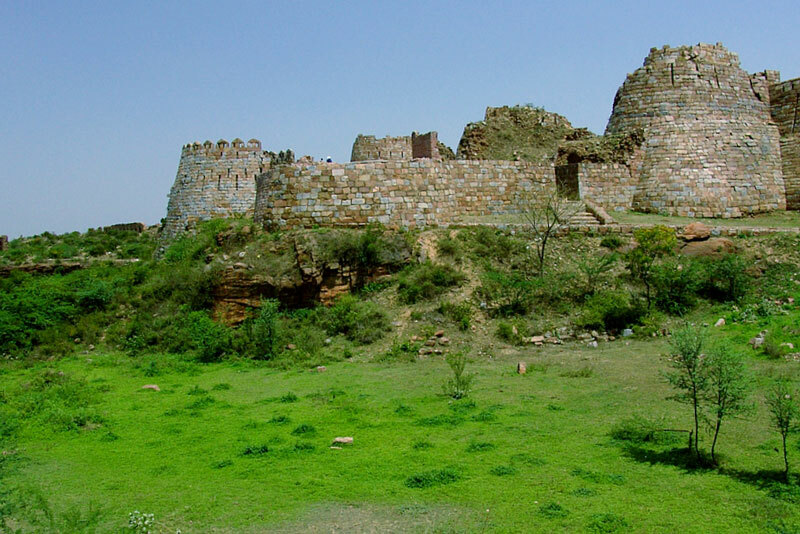 Ghiyas-uddin-Tughlaq was the first ruler of Tughlaq dynasty and founder of this gigantic stone fort-complex. He built this fortification in 1321 AD, after defeating the erstwhile Khilji ruler. Tall and sloping walls surround the whole fort-complex. 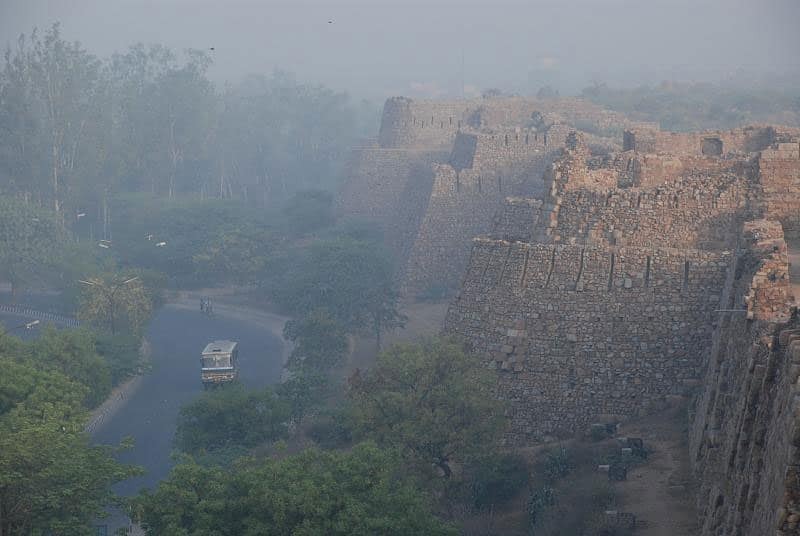 These barricading walls are up to 15 meters high, have battlement parapets, along with 2metres-high bastions. In 1327 AD, the Tughlaqs, owing to the superstitions, abandoned this magnificent fort. Wear comfortable and sturdy shoes, preferably sports shoes. Floors are uneven and have thorny grasses. Few crevices have insects, lizards, and snakes, too. Morning hours are the best time for clicking impressive snaps of its grounds and surroundings. Make sure to eat before you arrive here. There are no food stalls or eateries around. However, there is a small shop that sells all items at exorbitant prices. Have a look at its thirteen spectacular gates. Enjoy the panoramic view of its premises, royal mausoleum, and adjoining modern settlements, from the top. Don’t forget to take some stunning snapshots, too. Walk through various public halls, royal residences, and passageways. Learn about the fort’s secret underground passage and try to trace it out while you stroll around. See all remnants of 7 manmade rainwater harvesting tanks, inside. Travel to the southern walled outpost to explore its tomb-complex of the royal family. Hire a local guide who will educate you about different parts of this fort and their related history. March, April, and May are the best months for touring its enchanting ruins. Otherwise, you may visit this place in cold months of November to February. Visitors avoid coming here during the summer and rainy season. There are bus routes from Badarpur (Noida) as well as Gurugram (Gurgaon). Buses that make stoppage at nearby local bus stand are 34, 525, 511, and 874 etc. Govindpuri Metro rail-line is present 5 km away from here. Take an individual or shared autorickshaw-ride from metro to reach this site. The autorickshaw travel will cost you a minimum of 50 INR. The famous Sufi mystic, Nizam-ud-din Auliya cursed its construction by uttering: “Ya rahe ujjar, ya bassey gujjar”. It means, ‘either it stays occupied or taken by gujjars’. Saint Auliya also predicted Ghiyas-ud-din Tughlaq’s death by saying the now-immortalized words: “Hunuz Dilli dur ast”, meaning ‘Delhi is yet far away’. Surprisingly, Emperor died en route to Delhi after his battle victory in Bengal. Red sandstone, slate, and marble slabs were used for building its mausoleum. The tomb area is accessible via a 600 ft long bridge built across a now-defunct manmade reservoir. There is a grave of a commoner, named Zafar Khan, present inside the royal family’s mausoleum. According to wall inscriptions, his grave was at this area, before the construction work started. Only 13 entryways out of 52 fort-gates have remained intact at present. Ghiyas-uddin built the landmark Qutub-Badarpur road that was later renamed as Mehrauli-Badarpur road. Tughlaqabad Industrial Area or TIA has many good food joints. If you happen to visit this city, then do plan a tour to this opulent and less-visited colossal fortress. Nevertheless, it is an important relic of Indian history as it symbolizes the beginning of the significant Tughlaq dynasty.